Conceived during the confidence of the Roaring Twenties, the Baker Hotel opened in 1929 as an international resort destination. 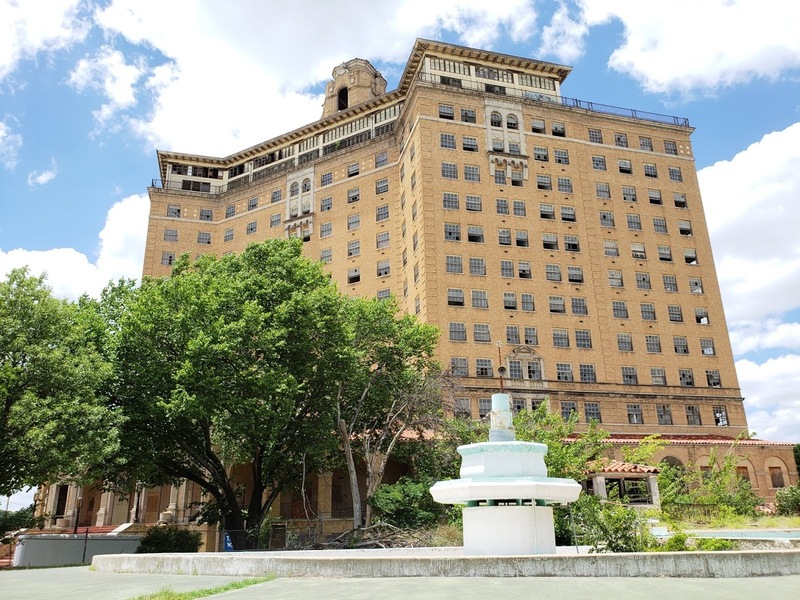 This “Grand Lady” of Mineral Wells, designed by prominent Texas architect Wyatt C. Hedrick, was built to take full advantage of the lure of the mineral waters present in Mineral Wells. The Baker reigned as one of the country’s most glamorous resorts for more than 25 years. Over time, its claim to fame only grew as Hollywood legends like Clark Gable, Judy Garland, and Lawrence Welk indulged in the hotel’s unique offerings. Unfortunately, the Baker succumbed to changing demographics, finally closing in 1972. 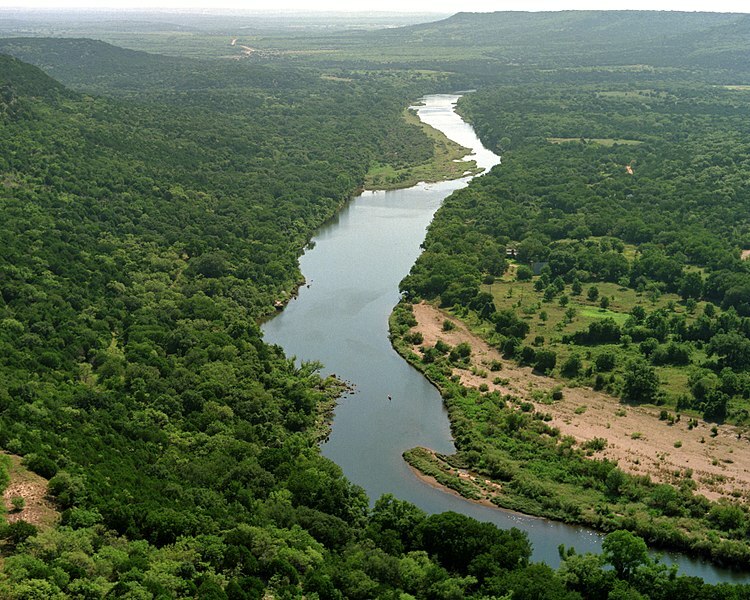 Palo Pinto County was given its name from a creek named by the Spaniards. There is much speculation by locals as to why the creek was named “Palo Pinto,” which means “painted stick” or “painted post” in Spanish. Some say the Spaniards came through the area in autumn and admired the colorful leaves, while others claim it was because they noticed uniquely colored or spotted lichen on trees along the creek. More than likely, though, the name Palo Pinto was derived from those who noted the colorful markings painted on tree trunks by Native Americans. 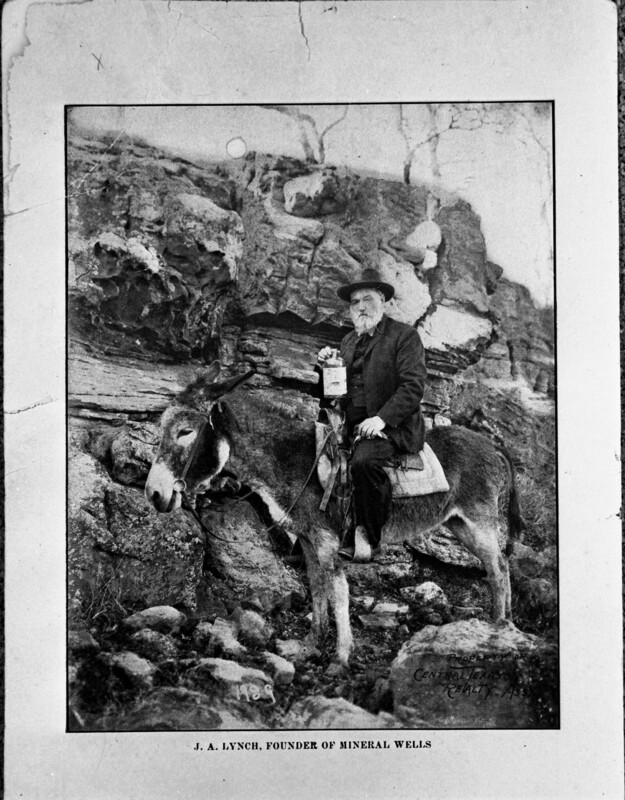 In 1877, James Alvis Lynch, his family, and 50 head of livestock left Denison, Texas, and headed west for a drier climate in hopes of it serving as a relief from malaria. Both James Lynch and his wife, Armanda, suffered from rheumatism. When the family got news of Comanche attacks further west, they decided to settle down where they were, in a valley tucked among the hills of Palo Pinto County. Although the location the Lynch family decided to settle in was quite beautiful, it was four miles from the only water source, the Brazos River. By the summer of 1880, a well driller named Providence agreed to drill a well in exchange for some of the Lynch family’s oxen. At first, the water’s funny taste worried the family, so they watered their livestock with it to test its safety. Soon after the family began to drink from the well, they found they were feeling better. News of the “healing” waters spread quickly. Neighbors began trying the water, and within a month strangers were showing up on the Lynch property, asking about the water. Almost immediately people were coming by the thousands to try this magical drink. Lynch’s well produced just 100 gallons per day, so he was forced to have guests sign a declaration affirming that they were sick and in need of the water. With the popularity of the water spreading, the town of Mineral Wells was laid out in the fall of 1881, with Mr. Lynch naming himself the first mayor. Several wells were drilled soon after the city was laid out, but the most famous mineral water brand was Crazy Water from the Crazy Well. The well is currently located at the Crazy Water Retirement Hotel. The well received its name because— the story goes—a demented elderly lady drank from the Crazy Well twice every day and overcame her illness. The crazy lady story could well be true, because in Mineral Wells most of the water wells have a significant amount of lithium, which is used to treat various mental and mood disorders today. Stories of Mineral Wells’ healing waters brought tourists from around the world in the early part of the 20th century. 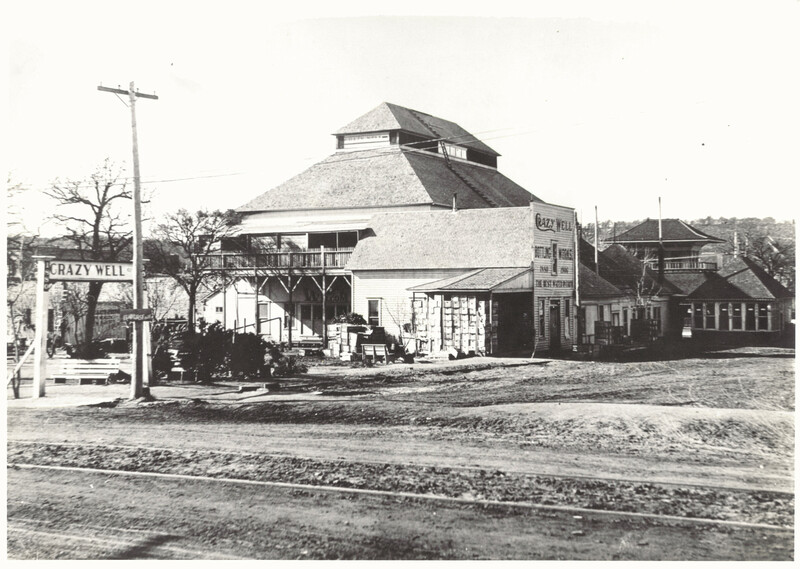 Soon bathhouses, drinking pavilions, and spas began to open to cash in. The trains that brought visitors also helped the mineral water companies distribute their products outside of the area. Entrepreneurs found more a more efficient way to ship the waters—namely by shipping the minerals only in crystal form. Those who bought the crystals could add them to their water and instantly have Mineral Wells mineral water. During the Great Depression, mineral water companies suffered due to the luxury nature of their product and the cost of a trip to Mineral Wells. On top of this, the Food and Drug Administration began to closely monitor medical advertising, thus limiting the claims local water companies could make. During this time there were also many medical advances, lessening interest in natural healing. Most of the water companies closed by the 1940s, but one company still remains, the Famous Mineral Water Company. Founded in 1904, it is the only place in Mineral Wells where you can sit at the bar, order a mineral water, and enjoy the taste that built this city. Old Camp Wolters: In 1925, Washington gave a grant to Brigadier General Jacob Wolters to build a training site in Mineral Wells for the mounted cavalry in Texas. This camp was named Camp Wolters and became the training site for the mounted cavalry guardsmen. Camp Wolters was designated an Infantry Replacement Center for the U.S. Army on March 22, 1941. The camp expanded from 50 acres to 7,500 acres within months. The newer part of the camp is now called Wolters Industrial Park, and Camp Wolters is now called Old Camp Wolters. During World War II, Old Camp Wolters housed German prisoners of war from North Africa. In 1945, when the war ended, both old and new Camp Wolters were deactivated. 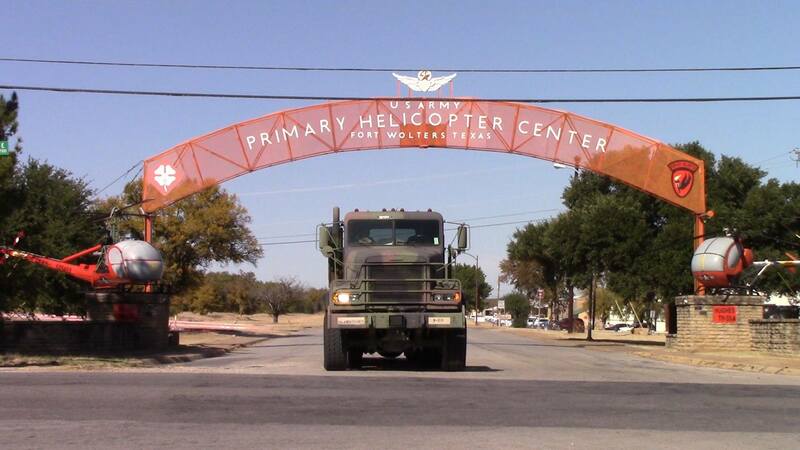 The National Guard sold Old Camp Wolters in 1965 to the Pratt brothers, who gave the majority of the property to nonprofit groups and the Mineral Wells Independent School District. Just east of Mineral Wells High School today is the original headquarters of Old Camp Wolters. Only one small rock building remains. It is maintained by the school district. A New Life for Camp Wolters: In 1951, the government reactivated New Camp Wolters as Wolters Air Force Base. New Camp Wolters was re-designated in 1956 as Camp Wolters Army Base. In 1963, the camp was renamed as Fort Wolters permanently and served as the home for the Primary Helicopter Training Center during the Vietnam War. The new Fort Wolters saw some 40,000 students from 30 countries go through the 20-week program conducted by the Southern Airways Company. An average of 600 students graduated each month in 1967. Fort Wolters officially closed in 1973, but it took around two years to completely shut down. Most of the Fort Wolters property was sold off in the 1970s and is now privately held. The National Guard uses one portion of Fort Wolters for training purposes.